Dry roasting is the best and healthiest way to roast raw mixed nuts. This method results in less fat and a deeper, richer flavor. A warm oven and baking sheet are the only requirements for roasting mixed nuts, although you may salt and/or oil them for added flavor after roasting, if desired. Any type of nut may be roasted, but some lend themselves more readily to the method. Hazelnuts, chestnuts, peanuts, pistachios, almonds and walnuts are all ideal for roasting. Preheat the oven to 350 degrees F while you prepare. Remove the outer shells from the raw mixed nuts and then spread them on a baking sheet with a lipped edge. Make sure they are in a single layer with none overlapping. Some varieties of nut, such as the Chestnut, may be roasted with the outer shell still intact. However, you'll need to slice into the shell to allow air to escape and prevent the nuts from exploding during roasting. Place the larger nuts on the outside of the pan and the smaller varieties towards the middle. Use more than one baking sheet if you have a large number of nuts or roast them in batches. Place the baking sheet in the oven and allow the mixed nuts to cook for 20 to 25 minutes or until they give off a strong aroma and appear golden brown in color. If the nuts are touching one another, stir them about halfway through the cooking time. If they are equally spread apart, stirring is not necessary. Take the roasted nuts out of the oven and remove the skins. Rub each nut gently with a clean kitchen towel and the skin should slide right off. The skins may be left on if you prefer. If you like your nuts salted, now is the time to season them. Although dry roasted nuts are lower in fat than those roasted in oil, if you wish to salt them, a bit of oil may be required to get the salt to stick. Spray very lightly with sunflower or a similarly light oil, and then sprinkle with salt to taste. You may omit the oil and use sea salt, if desired. Regardless of the method, the nuts must be seasoned and/or oiled while they're still hot. Store your roasted mixed nuts in an airtight container at room temperature or in the refrigerator. 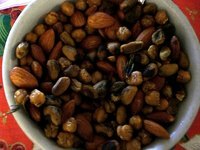 Roasted nuts will become rancid more quickly than raw nuts and should be consumed within three weeks of roasting. For the best results, don't roast more nuts than can be eaten within this time period.